Inafune teaming up with Inti Creates for summer-due action game. 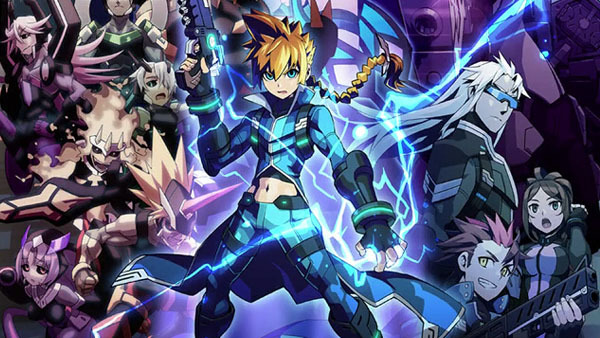 Keiji Inafune and Inti Creates announced Azure Striker Gunvolt, a 2D side-scrolling action game coming to the 3DS eShop this summer, at the BitSummit indie games festival in Kyoto. In the near future, a new type of psychic power has emerged. A powerful conglomerate, the Sumeragi Group, has brought peace and order to the world. But through its cruel subjegation of those possessing these powers. A psychic boy named Gunvolt has joined a rebel force to strike back. His goal is to free the world from Sumeragi’s control. Gunvolt’s ability is lightning. He can fire lightning rods at his enemies and zap them. One day, Gunvolt is ordered to kill virtual pop star Lumen. But he learns that Lumen is the avatar of Joule, a psychic girl. He hesitates to kill her, and this changes his destiny. He faces psychic opponents. Melac creates wormholes for unpredictable attacks. Daytona strikes with explosions and powerful leap attacs. As Gunvolt fights, his true powers slowly begin to awaken. Watch the announcement trailer below. View the first screenshots at the gallery. Visit the game’s website here.